Twin oil pipelines running below the Straits of Mackinac are unnecessary—and unnecessarily risky—a new study says. A portion of Line 5, an oil pipeline owned by Canadaian energy company Enbridge, runs for 7.2 kilometers (4.5 miles) below the waters of the Great Lakes at the Straits of Mackinac in Michigan. The aged oil pipelines that cross below the Straits that join Lake Michigan and Lake Huron can be decommissioned, according to a report released this week, without affecting energy consumers in Michigan’s Upper Peninsula or refineries in southern Michigan and Canada. Line 5, a 62-year-old pipeline operated by Canadian energy company Enbridge, carries as much as 540,000 barrels per day of light crude oil and natural gas from Superior, Wisconsin to Sarnia, Ontario. 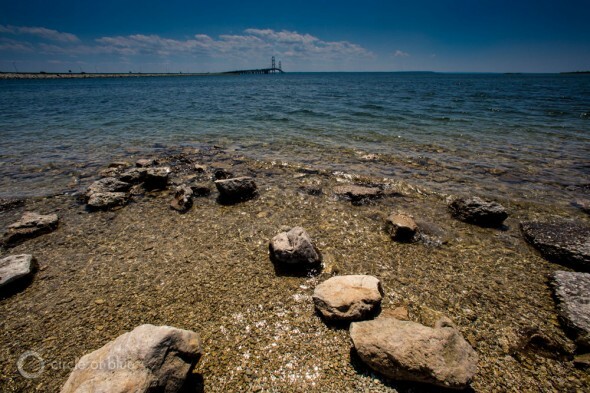 The pipeline has garnered intense scrutiny since a 2012 report by the National Wildlife Federation brought to public attention a 7.2-kilometer (4.5-mile) section of the line that runs underneath the Great Lakes at the Straits of Mackinac. The new report, commissioned by For Love of Water (FLOW), a Traverse City-based water law and policy group, asserts that the pipeline –and the risk it entails– is unnecessary. The oil products carried by Line 5 below the Straits of Mackinac can be delivered to customers utilizing other existing pipelines that do not cut through the Great Lakes, it concluded. The findings “directly refute claims by Enbridge that Line 5 is a ‘vital piece of Michigan energy infrastructure’ that must remain in the Great Lakes indefinitely,” according to a press release accompanying the report. Enbridge did not respond to a request for comment. Over the past three years, the Michigan state government, nongovernmental organizations, and the public have engaged in a collective weighing of the risks and benefits of Line 5. In its July report, the Michigan state pipeline task force recommended that the government assess alternatives to transporting oil through the Straits crossing, leaving the door open to shut the line down. Governor Rick Snyder, a Republican, formed the Michigan Pipeline Safety Advisory Board in September to carry out the task force recommendations, and also signed a deal with Enbridge to ensure that no heavy tar sands crude oil is shipped through the line. The existing pipeline system in the Great Lakes region could supply enough oil to refineries in Detroit, Sarnia, and Toledo that the section of Line 5 that runs below the Straits of Mackinac could be decommissioned, according to a new report. The debate over Line 5 has exposed an underlying tension in the Great Lakes; the region is at once a hub of tourism and recreation based on abundant natural beauty and also the beating heart of a vast energy transport system that draws oil from western Canada and pumps it through the manufacturing and export arteries of the Midwest. The two collided in 2010 when an Enbridge pipeline ruptured near the Kalamazoo River, causing the largest inland oil spill in U.S. history, and raised further questions about the burgeoning flow of oil through the Great Lakes region. Larger forces could also come to bear on the decision to allow or disallow Line 5’s continued operation. This month, international negotiators signed the first legally binding global deal to limit carbon emissions and slow climate change. The deal is expected to influence the transition away from fossil fuels, including the oil transported through the Great Lakes. At the same time, Congress is proposing to lift a ban on domestic oil exports that has been in effect for 40 years, a move that would likely increase the significance of the Great Lakes pipeline network. Line 5 is part of Enbridge’s continental pipeline system that stretches more than 3,000 kilometers (1,900 miles) across the Great Lakes region. In light of growing oil production in Alberta’s tar sands region and the American West, the company is pursuing a number of projects to upgrade and expand the capacity of its pipeline system. Upgrades to its Alberta Clipper pipeline, which runs through Minnesota and Wisconsin, would boost the line’s capacity to 800,000 barrels per day from 450,000 barrels per day. A second project to upgrade pumping stations aims to increase the capacity of Line 61, a pipeline that runs from Wisconsin to Illinois, from 560,000 barrels per day to 1.2 million barrels per day. In 2014, Enbridge completed a replacement of the Line 6B pipeline that ruptured near Kalamazoo, which expanded the line’s capacity from 240,000 barrels per day to 500,000 barrels per day. In effect, Enbridge is building an oil transport network for Canadian tar sands oil that replaces the Keystone XL pipeline — cancelled by President Obama in November — which would have transported up to 830,000 barrels daily from Canada to the Gulf Coast. With no State Department review, scant state oversight, and with thin public opposition Enbridge is close to completing the $10.4 billion project, which would make Gulf and Atlantic coast terminals accessible to tar sands oil. The FLOW report, presented to the Pipeline Safety Advisory Board on Monday, emphasized the need to assess alternatives to Line 5 through the lens of this larger system. 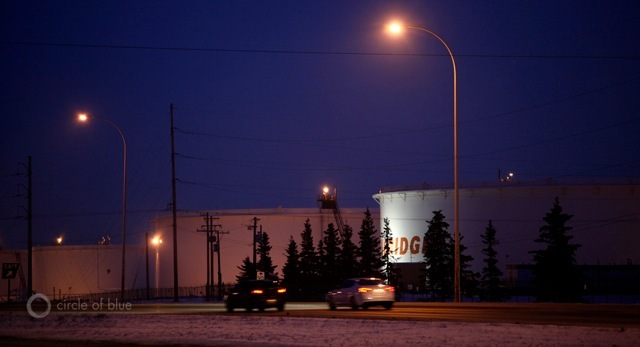 Enbridge, based in Calgary, is the largest shipper of Canadian crude oil. The company has pursued a multi-billion dollar project over the past five years to greatly expand the capacity of its pipeline system in the Great Lakes region to accommodate a growing supply of North American oil. “We were really troubled with this notion that alternatives meant alternative transportation modes—bomb trains versus pipelines versus oil barges,” Kirkwood added. Instead, the expansion projects, in conjunction with other pipelines bringing oil from the southern United States, mean there is enough capacity to provide the oil currently carried by Line 5 to refineries in Detroit, Toledo, and Sarnia from other existing pipelines, the report found. The portions of Line 5 north of the Straits crossing could continue to provide natural gas to Michigan’s Upper Peninsula, which receives 85 percent of its propane from the pipeline. Sections of Line 5 south of the crossing could also continue distributing oil produced in northern Michigan –about 10,000 barrels per day– to southern refineries. The FLOW report was sent to all 16 members of the Pipeline Safety Advisory Board. The board will thoroughly look at all of the alternatives, Judy Palnau, a spokesperson for the Michigan Public Service Commission, told Circle of Blue.